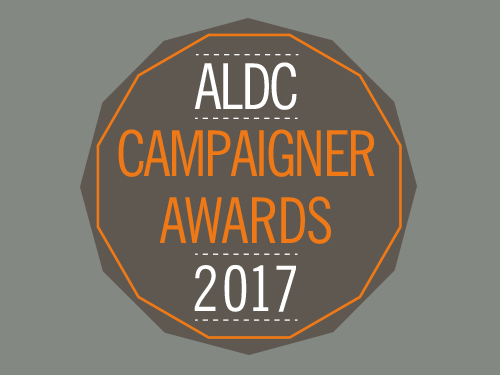 Each year, we recognise the outstanding work of local Liberal Democrat campaigners and campaign teams through our ALDC Campaigner Awards. And nominations are now open. Best By-election Campaign – We’re looking for local parties that have fought effective and strong by-election campaigns. We want to see your literature examples and hear about your strategy for winning the seat. Best Online Campaign – We’re looking for local parties that have run successful online campaigns or developed a winning digital strategy. You may have used social media, emails, your website or another digital platform to achieve your campaigning, fundraising or local Party growing aims. Let us know what’s worked for you. Best Literature Campaign – We’re looking for local parties’ examples of well-designed literature with strong messaging, photos and layout. Best Community Campaign – We’re looking for parties that have successfully campaigned with local residents to benefit their area. We are particularly keen to hear from parties that have engaged hard to reach groups and used innovative approaches to do this. Best Fundraising Campaign – We all know the importance of funding our campaigns and keeping our local party’s coffers in the black. Tell us how you engaged with your members and supporters to raise funds for your campaigns. You don’t need to have raised large amounts, we’re keen to hear how you innovatively appealed to your audiences. Email Claire Halliwell (claire.halliwell@aldc.org), Campaigns and HQ Team Manager, explaining who you’re nominating (you can nominate your own party), why and to which category. Please include some supporting materials, such as examples of relevant artwork and literature, as well as photos. You don’t have to be an ALDC member to enter. The deadline for us to receive your nominations is Friday 25 August. A panel will then meet to decide each category’s shortlist and winner. The ALDC Campaigner Awards will be presented during our AGM at Liberal Democrat Autumn Conference (16-19 September, Bournemouth) by a special guest. The winner of each category receives a cash prize. A final Overall Campaigner Awards Winner will also be announced too.